Vitamin B12 is essential for healthy red blood cells, energy, nervous system and cognitive function but it cannot be absorbed from food unless the stomach makes ‘intrinsic factor’, which may be reduced as we age, or in those with poor digestion. This delicious powder is absorbed directly from the mouth, avoiding the need for ‘intrinsic factor’. 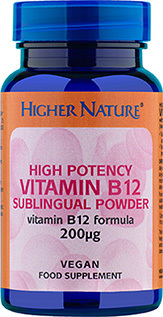 Take 1 level measure of sublingual vitamin B12 every other day under the tongue. 200µg Vitamin B12, 20mg Vitamin C, maltodextrin, brown rice flour, xylitol, beetroot, natural berry flavour, apple, cranberry. Sugar, salt, soya, lactose, dairy products, artificial preservatives, colours or flavourings.